The Prospectors & Developers Association of Canada said 2018’s convention attendance hit 25,606, the best turn out since 2013. The PDAC Convention in Toronto, arguably the world’s largest annual mining convention, is a bellwether of the industry’s health. Participants from 125 countries attend. Organizers said the improved numbers is proof that “mining industry has regained its swagger and is building momentum.” With the prices for zinc, copper and battery-related metals all up from last year, miners are enjoying a better top line. 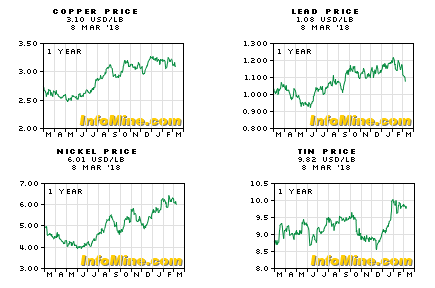 This time last year spot copper was US$2.60/lb. 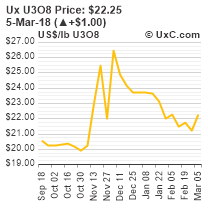 Today it is at US$3.10. Zinc is also up 25% to US$1.50/lb and cobalt is up over 50% to US$37.50/lb from a year ago. Money is also flowing into the junior sector. 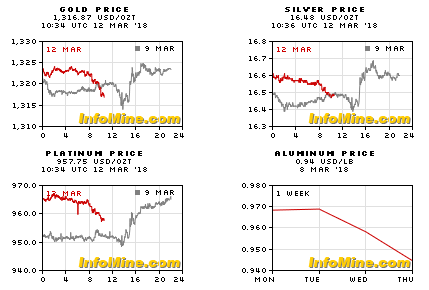 Note that PDAC enthusiasm is tightly linked to the direction of metal prices. 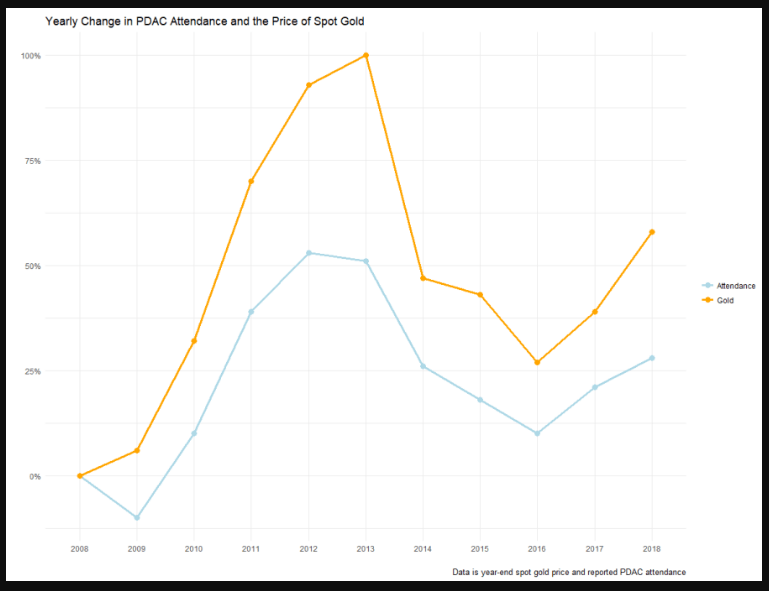 Here’s a chart so year-on-year change in spot gold prices versus change in PDAC attendance. Note that gold was at US$1,240/oz a year ago. It is now at around US$1,330/oz. 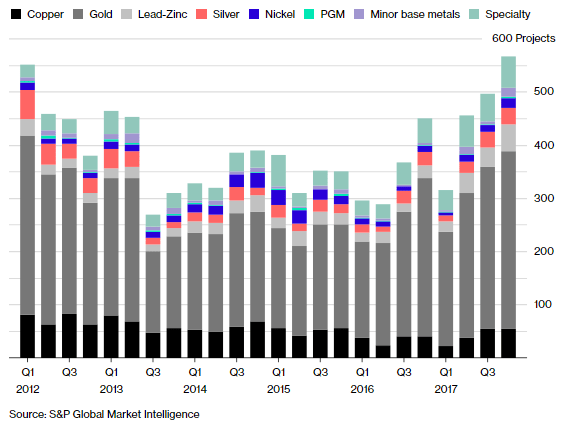 After a four-year slump, mining companies are spending on exploration again as interest in base metals rebounds and clean technologies boost demand for niche battery ingredients. Miners spent $8.4 billion searching for new metal deposits last year, about 15 percent more than in 2016, according to a report published Monday by S&P Global Market Intelligence. That exploration spending, which doesn’t include money used searching for iron ore, could increase again by as much as 20 percent this year, S&P said. If attendance at the world’s biggest mining conference is any indication, the industry has all but fully recovered from a painful downturn — although capital is still tight, especially for juniors. More than 25,000 mining executives, investors, prospectors, government officials and analysts from 125 countries poured into this year’s PDAC conference in Toronto, the most in five years. LAUNCESTON, Australia, March 8 (Reuters) – It’s safe to dismiss any impression that China’s imports of major commodities such as crude oil and iron ore were weak in February, despite the numbers suggesting as much. Congolese President Joseph Kabila will sign off on changes to the country’s mining code but left the door open to further talks after a lengthy meeting with senior industry executives who oppose the legal reform. 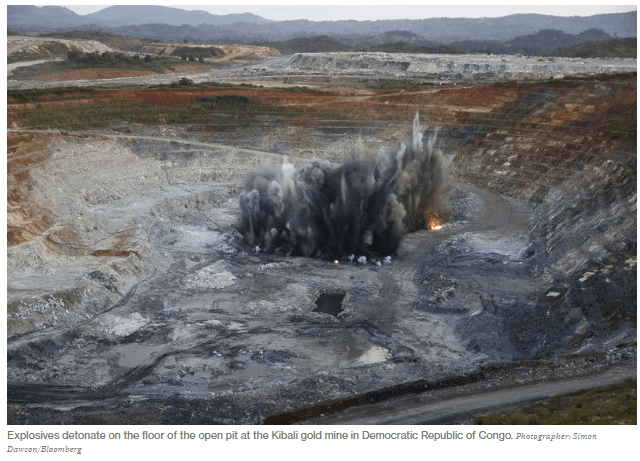 Glencore Plc Chief Executive Officer Ivan Glasenberg, Randgold Resources Ltd.’s Mark Bristow and other top officials met Kabila for five hours Wednesday in the capital, Kinshasa, to discuss the new rules. The changes will raise taxes and other costs for operators in Congo, which is Africa’s top copper producer and the world’s main source of cobalt, a critical ingredient in rechargeable batteries. SANTIAGO (Reuters) – Conservative billionaire Sebastian Pinera vowed to combat economic “stagnation” from years of centre-left rule as he started a new term as Chile’s president on Sunday, calling for austerity and support for the shrinking middle class in one of Latin America’s wealthiest nations. After receiving the presidential sash from outgoing socialist President Michelle Bachelet, Pinera, who served as president for four years before Bachelet, promised to help eradicate poverty and transform Chile into a developed nation within a decade. Pinera, 68, was elected in December with a strong mandate, becoming the newest member of a group of conservative leaders who have risen to power in South America in recent years – all of whom attended his inauguration. A Harvard-trained economist and the son of a prominent centrist politician, Pinera made his fortune introducing credit cards to Chile in the 1980s. As a candidate, Pinera said he would gradually balance the budget over six to eight years. To revive growth in the world’s top copper producer, incoming Mines Minister Baldo Prokurica said Pinera’s government would seek to rescue $50 billion in mining investments from bureaucratic red tape. But Pinera will have to govern with a divided Congress and a prickly leftist coalition that has vowed to fight his plans to lower taxes and “correct” Bachelet’s progressive policies. But Pinera’s timing is good. 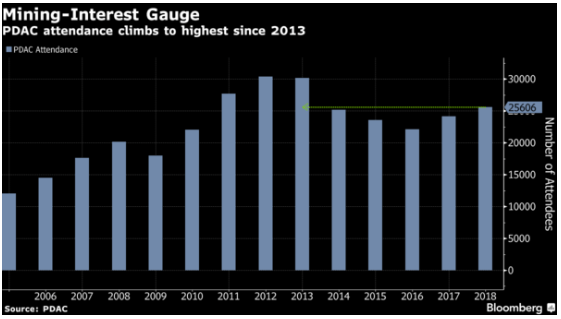 Rising copper prices have boosted Chile’s exports, helping shore up government revenues and revive growth in the country’s $250 billion economy. United Co. Rusal’s Oleg Deripaska agreed to let rival Russian billionaire Roman Abramovich sell a $1.5 billion stake in MMC Norilsk Nickel PJSC, providing that the sale is reversed if a London judge later finds that a shareholder agreement doesn’t allow it. Judge Christopher Butcher on Thursday approved the agreement, which includes Vladimir Potanin, a third Russian billionaire who has agreed to buy Abramovich’s stake. 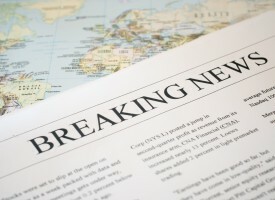 Whether the sale is permissible under the terms of a shareholder agreement will now be debated at a trial set for May 14. The agreement brings a brief hiatus in a decade-old battle of wills between Deripaska, the outgoing president of Rusal, and Potanin for control of the company known as Nornickel. The two came to a truce in 2012 after the intervention of Russian President Vladimir Putin and with the introduction of Abramovich as a mediating shareholder. The soccer club owner’s aim of selling most of his stake back to the feuding billionaires has inflamed tensions once more. The BattleBorn hackathon starts Friday March 9 and is a 54 hour, weekend-long open innovation event to be held at Rob Roy’s Innevation Center in Las Vegas, featuring real data and challenges direct from Barrick’s mining operations. Participants will be presented with four challenges and tasked with the opportunity of identifying inefficiencies and developing technical solutions to a selected challenge. In teams, participants will brainstorm solutions and develop an MVP over the course of the weekend, then pitch that solution to a distinguished judging panel of venture capitalists, technologists and industry leaders. Mentors from Barrick, Cisco, AWS and Unearthed will support participants all weekend and there is $20,000 in cash prizes up for grabs. 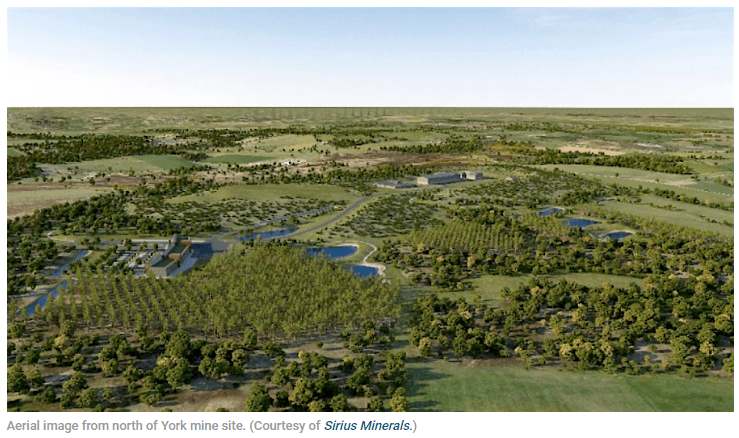 British company Sirius Minerals (LON:SXX), the company building a huge polyhalite mine beneath a national park, is looking to raise up to $2 billion in government-backed debt to finish building its fertilizer project in North Yorkshire. Delivering preliminary results for 2017, the company said its main focus this year will be securing up to $3bn from banks, including roughly $2bn under the government’s Infrastructure and Projects Authority, where discussions are ongoing. Chief executive Chris Fraser said the company already has deals to sell 4.4 million tonnes of the fertilizer a year and is seeking “similar arrangements” with northwest Europe and Brazil. 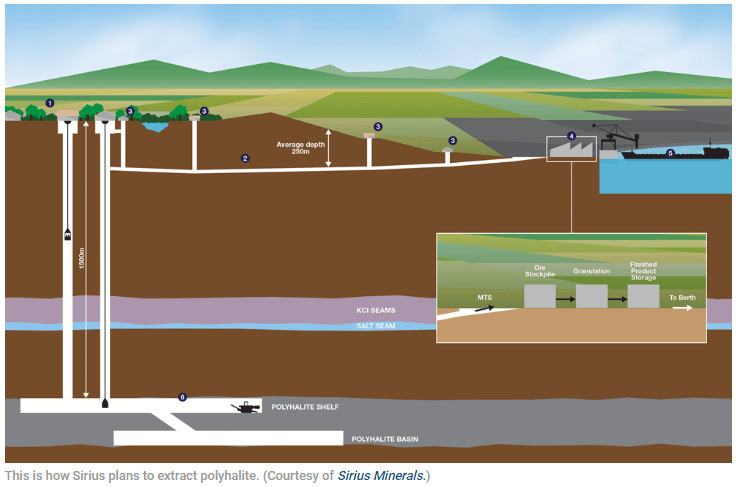 The goal to increase that figure to between 6 million and 7 million tonnes this year.